How do I reset my Enrollment Portal password? How do I register for the Enrollment Portal? Who do I contact If I am unable to make Health Benefit elections or need Technical Assistance? Step 2: Log on to the Enrollment Portal. 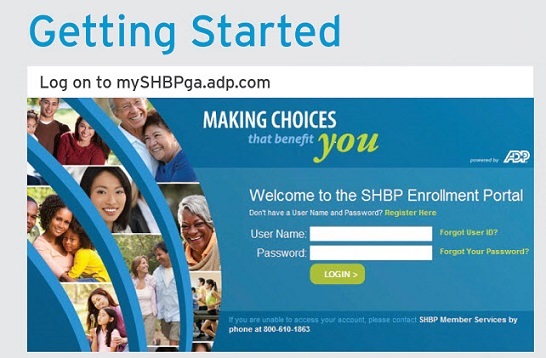 The homepage displays an enrollment event (e.g., Open Enrollment, Retiree Option Change Period, New Hire) indicating the event date for you on the top of the screen for elections to be in effect for the 2019 Plan Year. (If you are a first-time user, use the Enrollment Portal Instructions or if you are a returning user but have not accessed the website within the last 45 days, you can also use the instructions on how to reset your password). Step 3: Under the Open Enrollment window, click on Continue to proceed with your enrollment. Step 4: The Welcome page displays a terms and conditions message with the effective date. You must click Accept Terms and Conditions to continue to the next step of enrollment. Step 5: Click on Go to Review Your Current Elections. This screen displays appropriate default enrollments for you. Step 6: Click on Go To Review Your Dependents (if applicable). Verify that each dependent has a valid Social Security number (SSN) or other Tax Identification Number (TIN). Note: Active Members can only add a dependent(s) if they have a Qualifying Event (QE) or during Open Enrollment. Retirees can only add a dependent(s) if they have a Qualifying Event (QE). Step 7: To start your election process, click on Go to Make your Elections. Step 8: Click on Go To Tobacco Surcharge question. You MUST answer the tobacco surcharge question using the radio option. After you answer the tobacco surcharge question, the decision support box will display. You are provided an option to use the decision support benefit option comparison tool (i.e., Decision Support Tool) to help you choose the right plan to meet your needs. You can choose to decline or accept the opportunity to use the tool. Please see additional information in the Reitree Decision Guide or the Active Decision Guide regarding the decision support tools. Step 9: Click on Go to Health Benefits to choose your medical claims administrator(s), plan option(s) and coverage tier. Step 10: Make your elections. NOTE: For existing dependents, confirm that all dependent(s) that require health benefits have a check () in the “include in coverage” box. Step 11: Click on Go to Review and Confirm Changes. “Your elections” will display on the screen and show the elections you made. You should carefully review your elections. Step 12: Click Finish. If finish is NOT clicked, your enrollment process has not been completed, which means you have decided to make no changes. If you choose NOT to enroll into a plan option, you must click the radio option for No Coverage. A pop-up box will then display Reason for Waive. You will need to select the drop-down box which will populate responses. Next, scroll through the options provided and select a reason. The Reason for Waive must be populated to move to the next step. Step 4: Follow the instructions to answer a series of security questions. Note: If you do not know the answers to the security questions contact SHBP Member Services at 800-610-1863 to assist you with the password reset process. Note: If you answer the security questions wrong or spell the answer incorrectly (case sensitivity does not apply), you will have two more tries before you are locked out and must begin the process again. Step 2: If you are a first-time user, you must first register. (For users requiring a password reset, use the instructions on how to reset your password). Click "Register Here" on the main page. Use the registration code SHBP-GA and set up a password before making your election. If you are unable to make your election(s) online or need technical assistance, please call SHBP Member Services at 800-610-1863. For SHBP Member Services hours of operation click here. Note: For assistance with 2018 Open Enrollment (OE) or Retiree Option Change Period (ROCP) Health Benefit Elections for the 2019 Plan Year, Member Services must be contacted prior to the last day of the OE or ROCP. If you have questsions regarding Open Enrollment or the Retiree Options Change Period, visit the Enrollment page.